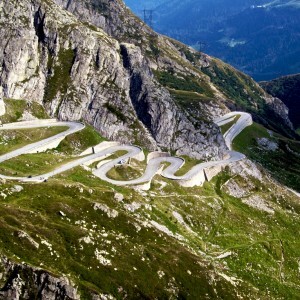 The Gotthard Pass or St. Gotthard Pass (Italian: Passo del San Gottardo) (el. 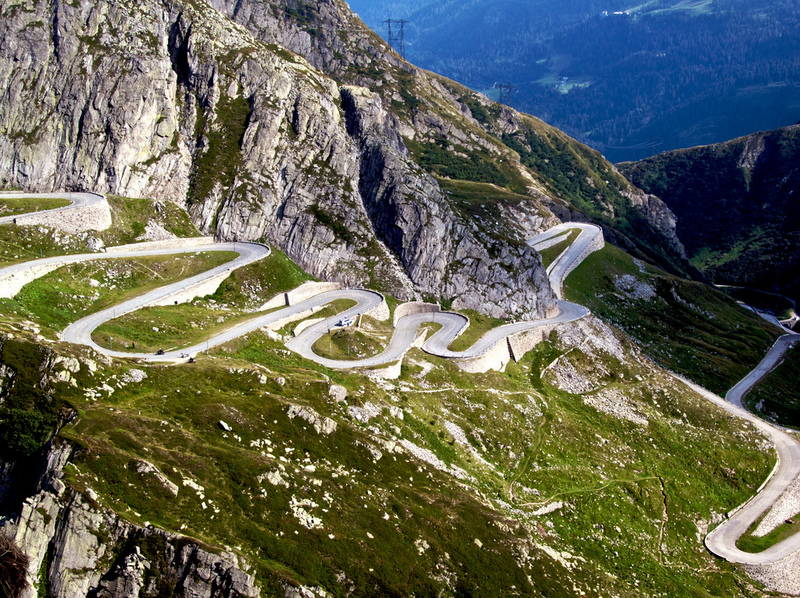 2106 m) is a high mountain pass in Switzerland between Airolo in the canton of Ticino, and Göschenen in the canton of Uri, connecting the northern German-speaking part of Switzerland with the Italian-speaking part, along the route onwards to Milan. The actual pass was built as in the upper section of today’s Schoellenen canyon a bridge across the River Reuss was built. The Devil’s Bridge, at that time a rickety wooden bridge, brought the first international traffic and on both sides of the pass commercial trading companies settled down. This trading communities (Saumgenossenschaften) were quite powerful and very quickly began to mess with the royal houses. Gangsestablished themselves immediately and asked the travelers for bridge toll. Later on in the century the passengers took the train to Goeschenen and were then guided by experienced hemmers over the pass. On July 27th in 1775 finally the first Gotthard crossing in a wagon is documented. An Englishman gave himself the pleasure for a high triple-digit amount of cash. For that event an infrastructure with two tracks based on round stones was built for the first time, which was swept away afterwads by an avalanche in the same year. The first railway tunnel was then opened on February 29th in 1880 at 11:15. Two years later, on June 1st, the great Gotthard railway tunnel was officially opened. The construction was accompanied by bloody riots of the workers, deaths and illness in the tunnel. The granite dust left deadly tracks in the lungs of workers. Many got sick, spit blood and did not live to see the completion of the tunnel work. The Gotthard was also expanded as a fortress by the Swiss nationals. Thanks God the days of the Cold War are over and the fortress dissolves slowly and is converted into Spa hotels. In 1886 the first fortress was built and many secrets entwine around the buildings. Miles over miles of corridors, elevators, bunkers, gun stands and hospitals lie hidden in the rock. An observant traveler may discover here and there, a barrack, a hatch, a shelter or a door in the rock. After the first street tunnel was built in the seventies through the Gotthard, which quickly became one of the most busy traffic South tangents, the Gotthard is drilled again. The transalpine route is built. A gigantic tunnel work with several starting points. It is worth to take a stop at the individual stations, turn off the motorbike and sift the facts and billboards in the exhibition buildings. A gigantic project created by humans, which still will take another few years for the construction.